The nice folks at Tropical Traditions sent me a great big jar of their Gold Label Virgin Coconut Oil to review. According to the website, Gold Label Virgin Coconut Oil is an unrefined oil – packaged in small batches, never exposed to high heat or chemical processing, and produced by family farms. My husband said, “what could possibly be so special about one coconut oil versus another?” I tended to agree with that sentiment. But, when it arrived, I happened to have 2 other jars of coconut oil in the cupboard, which made for some excellent comparison opportunities. The first thing we noticed when looking at the jar was how incredibly white it was – much whiter than the non-organic coconut oil I had in the house (which actually has a yellowish cast), and slightly whiter than the organic variety. Opening the jar, we were shocked by the aroma. I’d never had coconut oil that actually smelled so much like fresh coconut. There are both advantages and disadvantages to that. 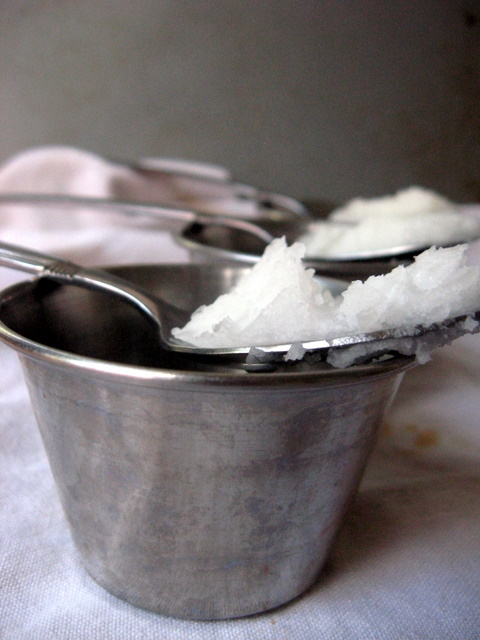 We often use coconut oil in recipes where we aren’t looking for an actual coconut taste or smell. This is not the coconut oil for those recipes. Tasting it, the flavor of coconut was also prominent. Wonderful coconut taste and aroma? That had to inspire a coconut-infused baked good. I came up with the following recipe, which really highlights all the positive aspects of this oil – the flavor and aroma shine through. Preheat oven to 350°. Spray a round 9″ pan with oil. Whisk together all dry ingedients except dried coconut. Add coconut oil and vanilla and mix with a hand mixer until mixture clumps together (several minutes). Stir in the dried coconut. The dough will be crumbly. Don’t panic. Dump all the dough into the pan, and pat it down firmly and evenly. Sprinkle the top with 1 T. sugar. Bake for approximately 35 minutes until edges begin to brown and center is firm. 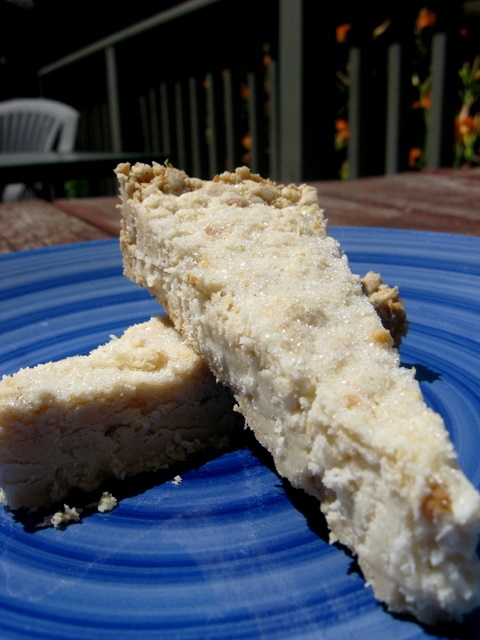 While warm, cut shortbread into thin wedges. If desired, you could skip the sugar and spread some chopped chocolate on the warm shortbread, allow it to melt, and spread it around. Be sure to still cut the shortbread while still warm, otherwise it will crumble when cutting. Now for the legal mumbo jumbo…. Disclaimer: Tropical Traditions provided me with a free sample of this product to review, and I was under no obligation to review it if I so chose. Nor was I under any obligation to write a positive review in return for the free product. This entry was posted in coconut, cookies, Product Review, vegan. Bookmark the permalink. Oh excellent! I’m glad to be of help. I’d be interested to see if it works in molded pans. They seemed to release fairly well from a plain pan. I’m always a wee bit concerned about fancy pans with gluten free baked goods. But, it’s certainly worth a try, right? Well, I just measured it by putting it in a measuring cup. Unfortunately, they don’t give a weight per tablespoon measurement on there jar. I usually measure that stuff by weight. So, it might have been a wee bit under a cup. But, I was basing the proportions off a gluten recipe and that’s how much butter they had you use, too. I don’t think I would have wanted to use any less. It just barely came together as it was. Or, I would have needed to add some water…. I made these today. I left out the shredded coconut and the xanthan gum and used tapioca starch instead of cornstarch. They turned out great!! !